Your foal is just a baby now, but within two years he'll reach 90 percent of his full growth, according to the American Association of Equine Practitioners. That can mean gaining as much as 3 pounds daily. Achieving a healthy growth level means correct feeding and management. You don't want a foal who grows too fast -- that can lead to health issues down the road. If it seems like your foal gets bigger every day, your eyes probably aren't deceiving you. Growth rates might also depend on when your foal hits the ground. In nature, most mares deliver in May or June, when spring grass provides the most nutrition for them as milk producers. Racehorse breeders prefer early foals, since each thoroughbred or standardbred officially turns a year old on Jan. 1. To achieve late winter or early spring foals, mares must be put under artificial lighting to induce ovulation. A study at Virginia's Middleburg Agricultural Research and Extension Center showed that thoroughbred foals born when nature intended, rather than by humans' plan, grow more rapidly. By the age of 6 months, the foal reaches approximately 80 percent of his adult height and half of his mature weight, according to Merck Animal Health. By this time, he's already been or is in the process of weaning from his dam. According to a University of Kentucky comparison study, foals weaned at the age of 4.5 months or at 6 months of age did not show much of a difference relating to growth and bone density if they were kept on pasture most of the time. The Henneke body condition score rates equine body condition on a score from 1 to 9, with 1 indicating extreme emaciation and 9 "extremely fat." Your foal's body condition should rate between a 5 and a 7, according to Merck Animal Health. A 5 rating is moderate; a 6 moderately fleshy, while a score of 7 is fleshy. If your foal exhibits a large crease down his back, he's no longer a 7 but an 8 or better. In other words, he's too fat. Once a foal reaches the age of 8 to 10 weeks, he needs more than just his mom's milk to meet his needs. However, that's also the period when he drinks more milk than ever. The American Association of Equine Practitioners recommends providing free-choice pasture or quality hay. Once he's a weanling, the AAEP suggests adding 1 pound of high-quality feed daily per month of age, divided in two or three meals. 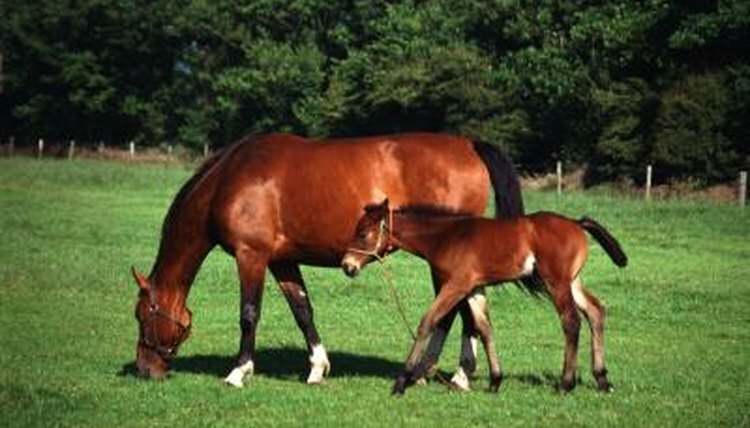 Always consult your veterinarian regarding the feeding program for your mare and foal. Foals experiencing too-rapid growth might experience issues such as contracted tendons, limb deformities and orthopedic diseases. Some breed also grow more rapidly than others or have a genetic predisposition to developmental orthopedic diseases. As veterinarian and equine nutritionist Dr. Sarah Ralston warns, it's not always the foals growing most rapidly who develop orthopedic disease, but those with the most erratic growth rates. Avoid feeding "sweet feeds," keep young horses at pasture as much as possible and ask your vet about ensuring that your foal receives the correct mineral concentration and balance in his feed.